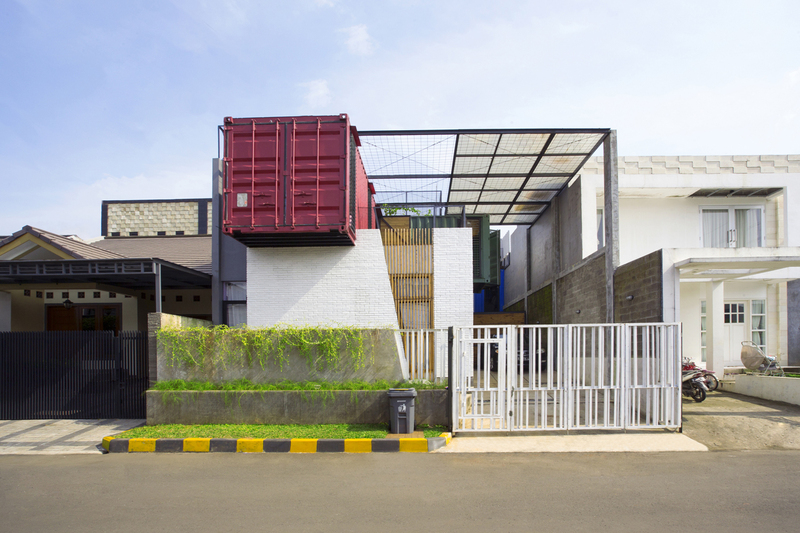 Atelier Riri devised creative ways to make living inside a shipping container in Indonesia’s tropical climate both comfortable and economical. The architects layered recycled pine, glass wool, and planter mesh on top of the home to help keep temperatures down. The 1,668-square-foot three-bedroom home is made of four colorful, crisscrossed containers equipped with a simple ventilation system that facilitates a constant breeze. A rich pine exterior complements the brick, which was painted white as a means to minimize the use of cement. The top of the residence is wrapped in simple wire mesh to encourage plant propagation. Natural light pours into the open-plan house, which is outfitted with low-cost materials like polished concrete floors and recycled metal railings. The hobby room features a custom desk and shelving system that Atelier Riri designed and manufactured themselves. A custom frame holds the family’s tools and other objects on the eastern wall. A sliding glass door in the downstairs living room leads to an outdoor patio and green space. A sofa and side table from IKEA complement an unfinished wood entertainment center. In one of the home’s three bathrooms, a TOTO toilet is illuminated by LED light fixtures from OSRAM. Simple square-shaped skylights and windows allow natural light to fill the space. A cherry red game room gives way to a second green space on the roof, which can be used as an extension of the indoor space. Covered with wire mesh, the green roof will continue to vegetate over time. For a site southeast of Jakarta, a young Indonesian couple asked eco-minded firm Atelier Riri to design a fun, contemporary home with designated spaces for their two kids to exercise their creativity. The project’s modest budget (approximately $55,000) led the architects to use shipping containers—a bold move given the region’s sweltering climate. “By concentrating on humidity and temperature control, we found economical ways to facilitate a comfortable environment inside a metal box,” says the firm’s founder, Novriansyah Yakub. His team crisscrossed four containers Lincoln Log-style and added shutters, windows, and sliding doors to create a cross-ventilation system. Layers of recycled pine, glass wool, and planter mesh on top of the containers further decrease temperature. Cost-effective elements continue inside the three-bedroom home, including custom wood furnishings and polished concrete floors. A roof garden equipped for rainwater harvesting connects to the residence’s crown jewel: a bright red game room, now chock-full of toys.